Sure, Poké Stops can be great for picking up potions and extra poké balls, but wouldn’t they be just a little bit better if you could snag a cocktail at them as well? If you’re like me (and millions of other people) and have become obsessed with playing Pokemon Go, then have I got the cocktail list for you. 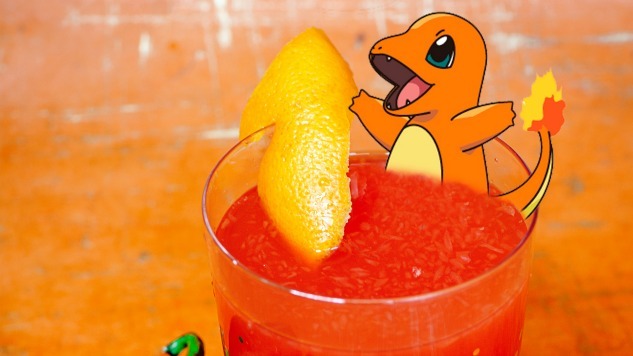 From the spicy Charmander’s Ember to Poliwag’s simple martini, these six Pokémon-themed drinks are the perfect thing to have right before you hit the streets in search of the ever-elusive Pikachu (where the heck is that guy, right? ), or to have at home when you just want to crack an incense open and collect them all from the comfort of your couch. A refreshing unison of pineapple, lemon juice and Blue Nectar Tequila, will revitalize and quench the thirst of any Poké Master! Directions: Combine all the ingredients in a cocktail shaker. Top with ice and shake vigorously. Strain over crushed ice. Garnish with pineapple and sage leaf. Equipped with Diplomático Reserva Exclusiva, rum aged for up to 12 years with distinctive notes of maple, orange and brown sugar, this golden-hued cocktail will make a splash among your friends. Directions: Combine all the ingredients in a mixing glass with large ice. Garnish with grapefruit zest twist. Prepare a perfect blue martini that embodies the popular water-type Pokémon, Poliwag. This refreshing cocktail featuring blue London No 1 gin is a perfect way to cap off your night. Directions: Shake in Boston shaker and double strain into Martini Glass. Garnish with blueberries. Sparkling and fruity, this ruby red cocktail features Vermouth Royal Rouge and Bisol Jeio Prosecco, paired with raspberries. Sweet and delicious, this drink will sure to be a crowd pleaser! Directions: Stir together raspberries, vermouth, and agave nectar in a pitcher. Occasionally stir and let the mixture sit and chill in fridge for about an hour. Pour into six champagne flutes and top with Prosecco. With a base of Usquaebach Whisky, a Scotch crafted with the firey spirit of the Scottish highlands, alongside the spiciness of habanero peppers and the sweet kick of fresh blood orange juice, this subtly smoky, flame red sipper embodies our favorite fire type; a little feisty, a little sweet. .5 oz. habanero simple syrup (In a saucepan, heat equal parts sugar and water. Slice one habanero pepper, and remove seeds. Add habanero slices to the pan. Allow to cool). Directions: Combine all ingredients and stir with ice. Strain into rocks glass. Flame the blood orange peel with a lighter to express. Drop into drink and serve. Adding a jolt of energy to your beer game, this citrus forward beer cocktail pays tribute to Pokémon’s origins by incorporating the light expression of the #1 selling Asian beer brand in the U.S. Directions: In a tall cocktail glass add orange juice and honey syrup, top with Sapporo beer and orange bitters. Stir gently with bar spoon and garnish with orange slice. Emily is Paste’s Assistant Drink Editor, and is probably catching her 1,000th Rattata or drinking one of these cocktails right now. You can find out for sure by following her on Twitter @emily.